Holistic methods for getting to sleep. To be able to sleep well at night, it is vitally important to get up in the morning at a fixed time — at or before 6:00 AM, says Ayurveda. And try to go to bed at or before 10:00 p.m. Try you best to establish this routine: wake up before six and go to bed by ten PM. Ayurveda did not come up randomly with this suggestion, and instead bases it upon a deep science of chronobilogical rhythms. Modern research is demonstrating that indeed, following this specific lifestyle prescription, restores sleep. Let me forewarn you that once the clock strikes ten, you might get a second wind. You might start thinking about unpaid bills, unanswered e-mails, or the closet that still needs to be reorganized. So as a precaution, I recommend that you take my advice and prepare to go to bed by 9:30 p.m. so that you are well asleep by 10:00 p.m.
It’s important to establish and maintain this sleep-wake schedule at suggested times. There may be an exceptional day, but let those days be the exception, not the norm. Remember that your inner clock has no concept of “sleeping in” or “making up sleep”. Also try to have a gap of at least three hours between dinner and bedtime. An application of oil to the body at bedtime pacifies the nervous energy (from the days activities) and calms the mind. It instantly aids sleep. So one important lifestyle recommendation is that you gently apply a tiny amount of warmed oil to the soles of your feet, your ear lobes, and if possible, the crown of your head. You can use a dry or warm and slightly wet towel to wipe o any excess oil. Naturally sweet tasting foods are especially sleep inducing as per Ayurveda. So if you have more than an occasional problem of interrupted sleep, examine your food choices through the daytime and over the week and months and give up drying foods (like chips) and spicy foods (like salsa). Avocado, banana, dairy, cane sugar, sweet fruits, squashes, nuts, fish and goat meat contain natural sweetness and oiliness and are recommended by Ayurveda. Seafood soup is especially useful for sleep in Ayurveda. Mildly spiced fish and crab soup, in moderate quantity, along with cooked rice on the side, can be a great selection for lunch at least twice a week. This is an excellent sleep promoting drink. Drink at least three hours after dinner and no later than half an hour before bed. 1. Combine milk and water in a medium saucepan. Add all the spices (but not the sugar). 2. Heat on high, stirring occasionally until the mixture begins to boil. 3. Quickly reduce heat to medium-low and stir occasionally, ensuring the mixture does not boil over. Cook until the added water has evaporated (20–25 minutes). 4. Once the liquid has been reduced down to 1 cup (approximately), remove from heat and strain, discarding any pods or spices left at the bottom. 5. Add sugar to taste. Drink hot or warm. Make your bedroom a special, restful space (with right intention and not necessarily a monetary investment) that simply invites sleep and calm and awakens you with equal radiance in the morning. Before bedtime, make sure the stage is set for sleep. The lights can be dimmed in advance, and you can light candles as you prepare for bed. If you have to have a desk in your bedroom, then as night approaches, tidy this area deliberately, close the lid of your computer and other gadgets, and calm this activity area. Shut of all electronic devices at bedtime. Thee classic text Ashtanga Hridayam, from 550–600 CE, suggests pleasant sounds in the background such as soft music or wind chimes; pleasing smells emanating from the essential oils you have applied to your body or fragrant flowers in the room; a fresh, natural breeze; and an inviting, comfortable, well-draped bed in the room, which is essential for a good night’s sleep. Prepare Yourself Mentally for SleepA short meditation every night in bed helps settle the mind. Yoga postures can help tremendously promote sleep but not when they are done at bedtime) include head-to-knee pose, seated forward-bend pose. The corpse pose can be taken up before bed also. Ultimately, the best mental preparation you can do to welcome sleep is to accept the fact that sleep is your best friend in your quest for health, success, wealth, and relationships. It is not merely a necessary pause in your life. Sleep is a time for retreat, when you can let go of the world and deeply rest. Once you realize what an important role sleep plays in your physiological and psychological well-being, you will begin to welcome sleep every night. 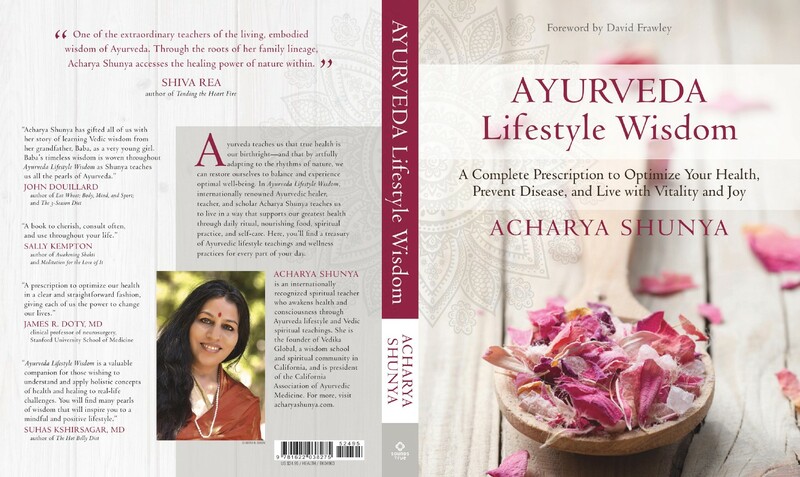 Excerpted from Ayurveda Lifestyle Wisdom: A Complete Prescription to Optimize Your Health, Prevent Disease, and Live with Vitality and Joy, by Acharya Shunya. Sounds True, February 2017. Reprinted with permission. Author of Ayurveda Lifestyle Wisdom (Sounds True, 2017), Acharya Shunya is an internationally recognized spiritual teacher who awakens health and consciousness through Ayurveda lifestyle and Vedic spiritual teachings. She is the Founder of Vedika Global, a wisdom school and spiritual community, and is President of the California Association of Ayurvedic Medicine and Author of Bestselling Book Ayurveda Lifestyle Wisdom. In 2015, Shunya was recognized as one of the Top 100 teachers of Ayurveda and Yoga in America by Spirituality & Health Magazine. For more information, please visit her website and connect with her on Facebook and Twitter.